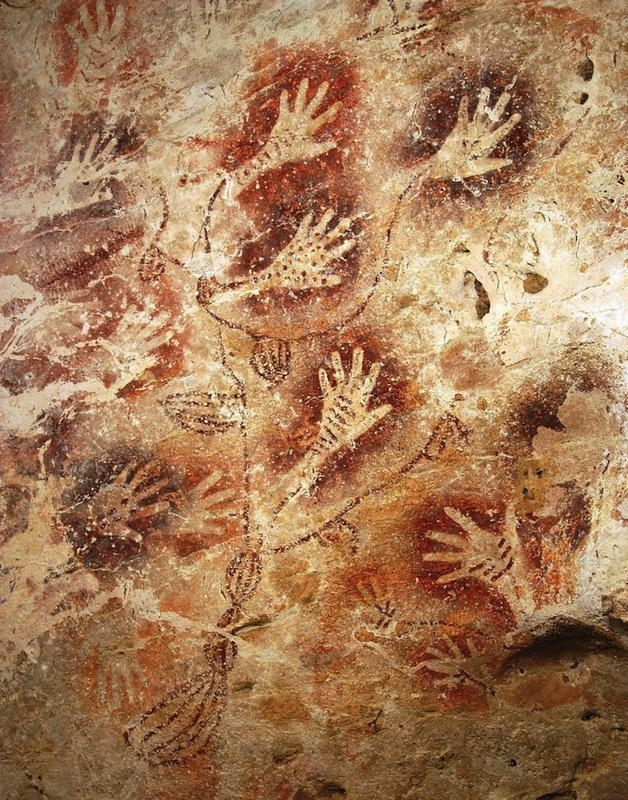 The painted murals and relics of Sanskrit-speaking communities from the Paleolithic period are not limited to Europe, but are evident on cave walls all over the world, even in the tropical jungles of Indonesia. 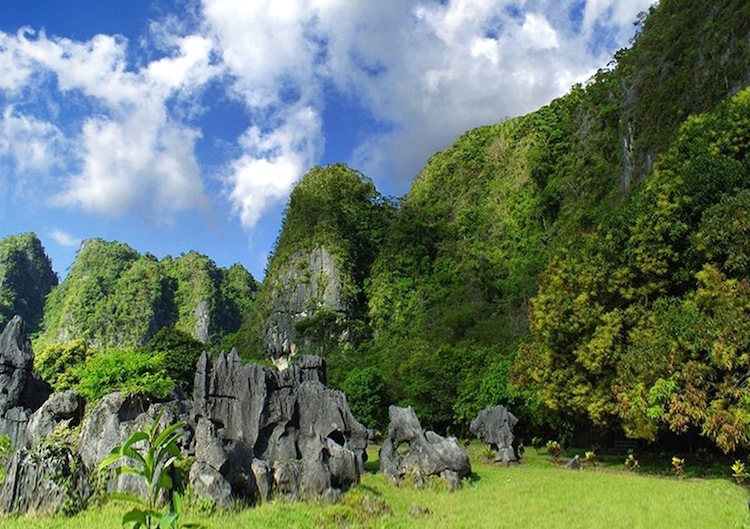 The Leang Leang karst limestone caves discovered in South Sulwesi in the 1950s, near Maros, contain various painted animal pictograms conserved despite the extreme humidity. Paleolithic limestone cave painters in Indonesia produced geometric and animal pictogram murals that bear a striking resemblance to those of Europe from the same period, including many hand stencils that rank among the oldest in the world, dating as far back as ~40,000bp according to RC-14 analyses. Large limestone outcroppings located in the lush Leang Leang Valley were carved and eroded over the millennia of ancient occupation of a cluster of dozens of caves close by (above). The piezoelectric calcite content of the geopolymer limestone walls of the Leang Leang caves effectively transduce infrasound standing waves focused onto the area by the Great Pyramid, also constructed in geopolymer limestone. Impressive overhangs hide the cliff entrance of Prasejarah Cave overlooking the valley (below). 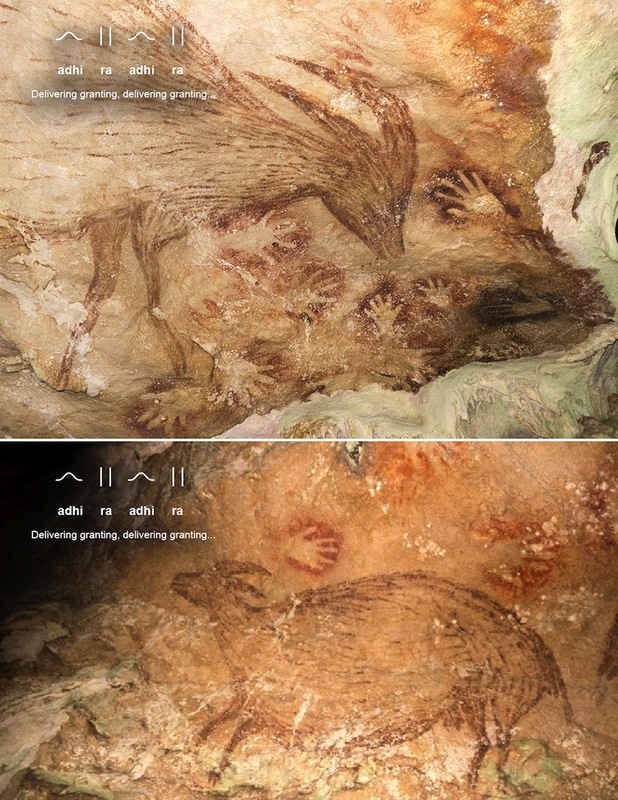 Several surviving examples of animal murals painted within these communal cave networks depict a primitive species of fruit-eating pig endemic to the Wallacean archipelago called babirusas in the native Makassar language meaning 'pig-deer'. The bold painted outlines of the body and legs of each babirusa pictogram encode language signs that read: adhi ra adhi ra --"Delivering granting, delivering granting..."
At Petta Kere Cave, the leafy canopy permits sunlight streaming through the grand entryway (above). Flowing wall textures and weathering patterns of the stone are highly reminiscent of European Paleolithic habitation sites. Animal figures painted in red ochre at Petta Kere represent anoas, a type of pygmy water buffalo endemic to Sulawesi. The forms of the body, horns and legs convey the familiar repeating phrase: adhi ra adhi ra --"Delivering granting, delivering granting..." Several other painted pictographic panels at Petta Kere and Prasejarah Caves reiterate similar votive phrases (below). The labor-intensive preparation of cave walls with thick layers of limestone geopolymer paste sealed out water and enhanced transduction of focused infrasound for bioelectrical healing. Detailed photographs of the painted cave wall surfaces present the consistent hallmarks of geopolymer limestone wall refaçading (above) --for enhancing bioelectrical functions not yet considered by any of the investigating archeologists. The Leang Leang Valley, South Sulawesi (4.99°S 119.67°E) is located 6,307 miles from the Great Pyramid in present-day Giza, Egypt --a resonant distance corresponding to 25.3% of Earth's mean circumference of 24,892 miles. This special geoposition on the 5° South latitude intersects the resonant band of focused infrasound along the 25.25% distance from the Giza pyramids. In fact, this focal band of planetary resonance is rumbling back into heightened activity with the imminent Magnetic Reversal of Earth. 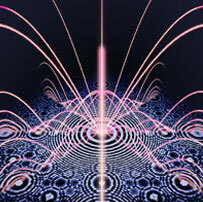 Infrasound-induced piezoelectric fires have ignited along this resonant distance in New Ulm, Minnesota in June of 2011, preceded by rumbling noises and a crop circle that formed the previous month along the same 25.25% distance from Giza, in Madisonville, Tennessee. Tantalizing evidence of the ancient psychoacoustic technologies of Paleolithic societies worldwide is continually being uncovered despite the lack of recognition as sophisticated cultural remains. The amazing acoustics of the caves are rarely appreciated by modern researchers, while the most profound infrasound frequencies that inundate the cavesites are not perceived by modern visitors. 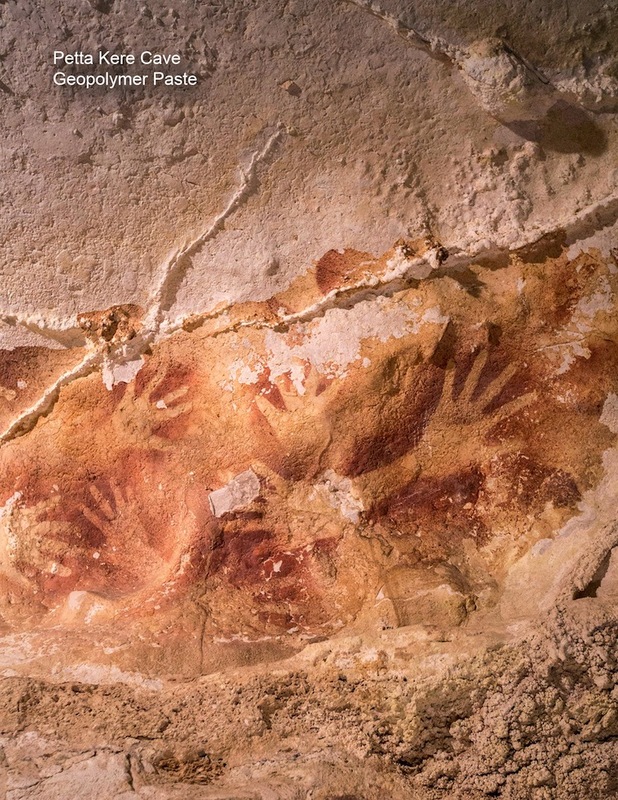 A multitude of cave paintings has been recently discovered by a French research group trekking to caves in East Kalimantan, Borneo, led by speleologist L-H. Fage and archeologist J-M. Chazine. Explorations in the Marang range of karst gorges identified 36 linked Paleolithic cavesites denoted by hundreds of airbrushed hand stencils, as stunningly exemplified on the ceiling above the entrance to Tewet Cave (above). Many of the red ochre hand stencils display inset hieroglyphic Sanskrit phrases. 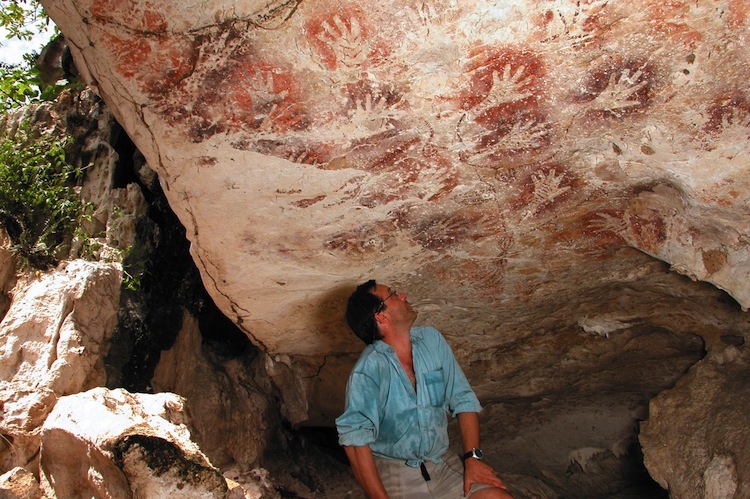 Dozens of red ochre hand stencils airbrushed on the walls of Tewet Cave bear geometric markings rendered within the negative space left by the artist's hand. The thumb and four-fingered hand conveyed "for dwindling", as emphasized by inset lines forming the glyphs in multiple examples (above). Clusters and lines of dots make votive references to Jupiter as "the one", and to the Sun and Jupiter as "the two". 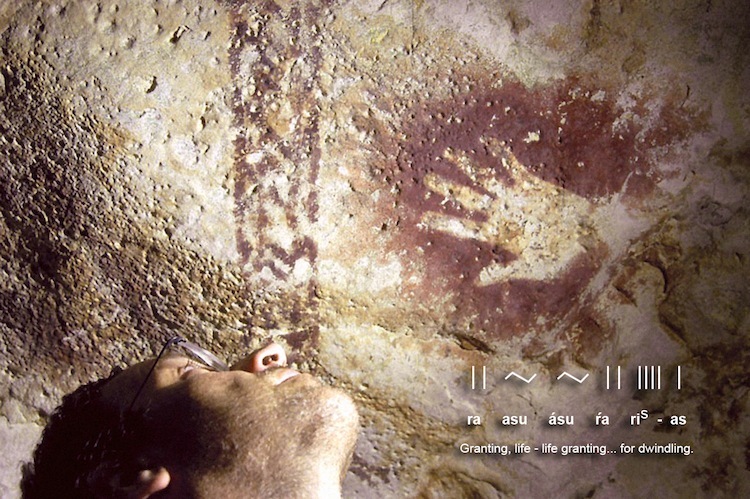 The most common Paleo-Sanskrit glyphs at Tewet Cave are repeating one word attributes of the resonance of Jupiter being transduced by the geopolymer cave walls, infusing lifeforce in barefoot cave dwellers: ris --"dwindling", ra --"granting", raua --"roaring", traya --"protection", plava --"inundating", and kar-as , meaning "workings". 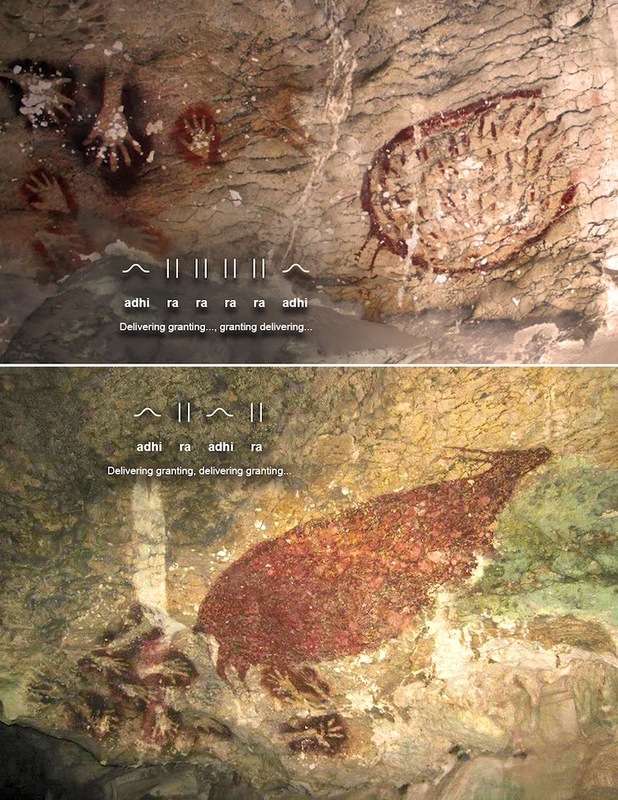 These most ancient language signs embedded in the airbrushed hand stencils at Tewet can be viewed in a beautiful interactive 360° panorama presentation online. Tewet Cave, East Kalimantan (1.03°N 117.26°E) is 5,957 miles from the Great Pyramid, comprising 23.93% of Earth's mean circumference, where reception of planetary infrasound standing wave resonance is accomplished effectively. Spontaneous piezoelectric fires are recurring with increasing frequency and intensity along the 23.9% resonant distance alignment in the Canadian city of Windsor, Ontario and in the Guyanese capital city of Georgetown, Guyana where local residents have complained of low-frequency rumbling and ground vibrations. In addition, Tewet Cave and the other Paleolithic cavesites of the Marang River karsts are geopositioned along the 1° North latitude, perfectly conforming to a well defined pattern of high-precision geopositions selected by Paleolithic cave-dwellers and pyramid-builders worldwide for enhanced transduction of infrasound resonance focused by the Great Pyramid. Lascaux Cave, in France, sits at 45° North latitude. At Ham Cave, East Kalimantan (1.09°N 117.33°E) long rows of hand stencils mark the smooth walls of a recessed area (above). The left hand of a male individual appears to have been stenciled many times, perhaps marking the niche for bioelectrical healing, with the very smooth contours of the piezoelectric limestone ledge accommodating a reclining recipient of hands-on healing from practitioners of Ayurveda. 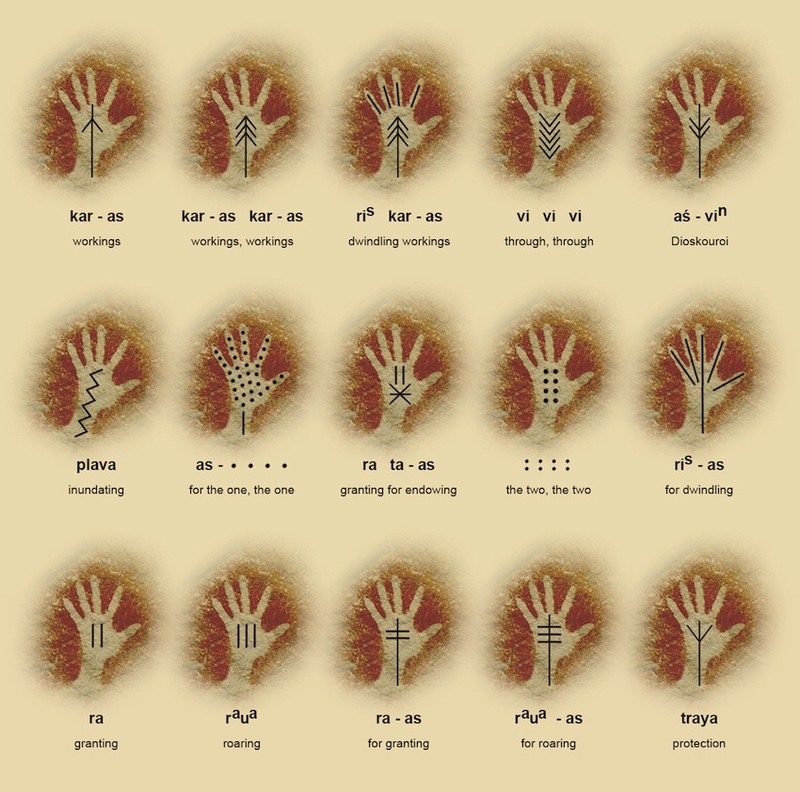 This interpretation of the significance of handprints may explain why the hand stencil ligature is repeated hundreds of times throughout the major Paleolithic cave painting sites of Indonesia and Europe, as well as throughout Aboriginal Australia and witnessed on all other inhabited continents of the world. The inset hieroglyphic hand stencils of Tewet Cave leave no doubt that the hand was rendered as a ligature pictogram specifically conveying the glyph pair ris-as , meaning 'for dwindling'. The piezoelectric calcite mineral content of geopolymer cave walls and pyramid stones, when considered in conjunction with the special geopositioning of the sites, irrefutably confirms that the 'roaring' of planetary infrasound resonance was technologically transduced for synchronizing consciousness and raising the 'dwindling' vital forces of human bodies. This advanced technology is far older than most have surmised. The primary construction period of the Great Pyramid actually predates the Egyptian civilization by more than 65,000 years, having been engineered far earlier, during the Paleolithic Era along with many other pyramids that are now submerged on continental shelves and in the unseen depths of the world's oceans. 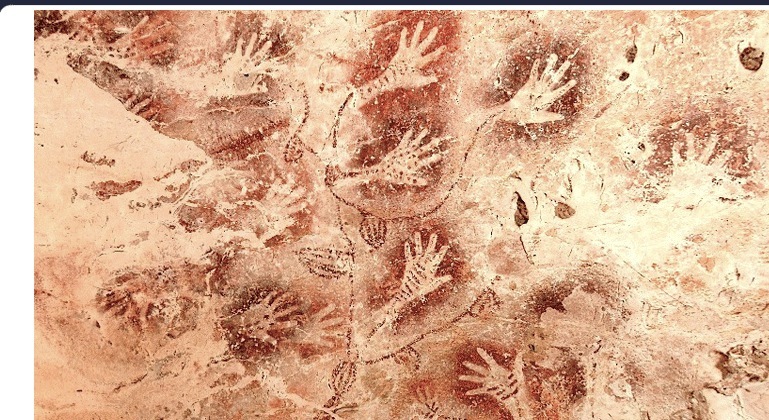 The highly advanced and culturally specific geopolymer refaçading and pictographic painting techniques were usually employed by Paleolithic cave dwellers at the most inaccessible caves located high on the karst cliffs, distinguishing them from later Holocene habitation periods that made use of the lower, more easily accessed caves. Use of caves for funerary burial sites was customary only during later periods. In 2006, Harto Cave was discovered in East Kalimantan's Marang River region by the Fage-Chazine research team --the 36th painted cave yet documented by the dedicated group. Illumination of the ceilings of Harto Cave revealed a well preserved artifice that had apparently been well prepared for ochre murals. 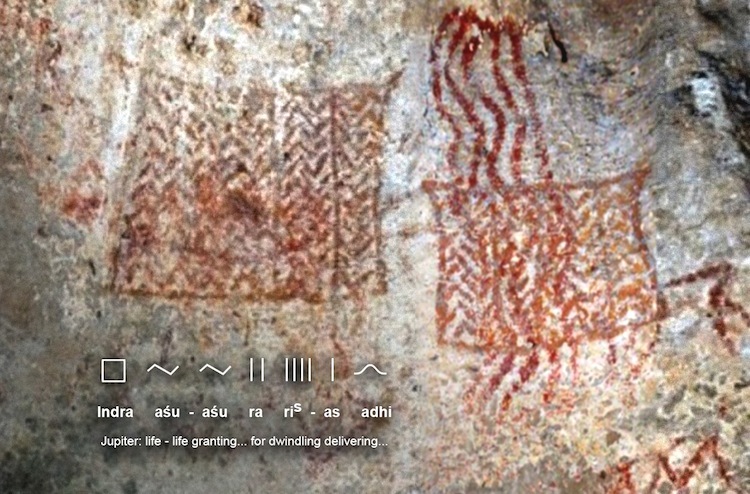 A large geometric babirusa pictogram was painted on the ceiling at Harto adjacent to another zoomorphic pictogram, perhaps depicting a lizard, composed of repeating vertical glyph lines next to the hand stencil of a male airbrush artist (above). Altogether, the embedded hieroglyphs offer a votive statement lamenting Jupiter's degrading resonance: ra asu asu ra ris-as , meaning "Granting, life-life granting... for dwindling." Piezoelectric limestone caves bearing artificial geopolymer wall façading and ochre pictograms have also been located in South Sumatra, Indonesia. 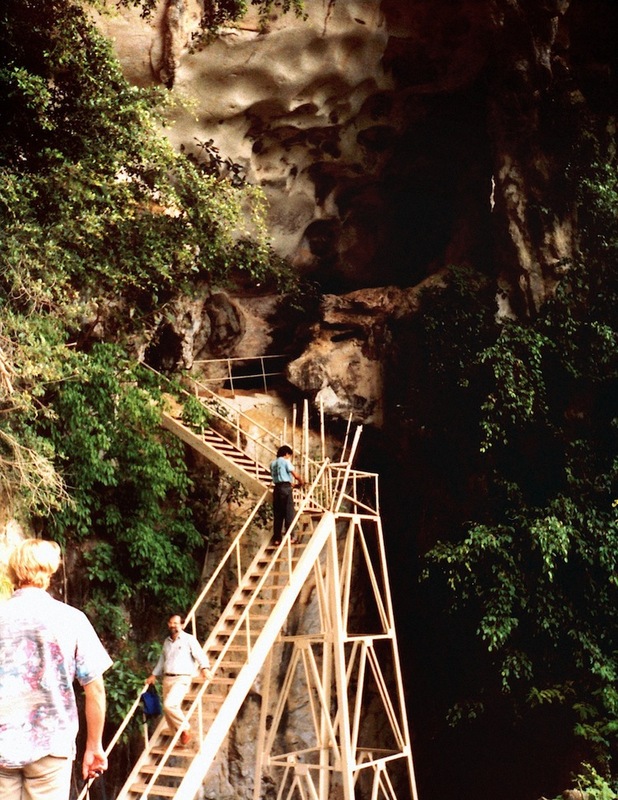 Multiple occupation periods were identified at Harimau Cave, used as a burial site for the interment of skeletal remains from 66 individuals ~3,000 years ago. Impressive geometric panels painted within Harimau Cave can now be translated accurately, within the proper sense and context of Vedic bioelectrical technologies practiced at hundreds of other caves around the world. The square format of the Harimau murals praises vital forces transmitted from Jupiter, reading: Indra asu asu ra ris-as adhi --"Jupiter: life - life granting... for dwindling delivering..." (above). Radiocarbon dating of animal bones and charcoal from the deeper layers of excavations conducted at Harimau Cave determined an age of over 15,000 years, although the most profound deposition layers have not yet been identified, with primary occupation likely extending back tens of thousands of years. Harimau Cave, Sumatra (4.07°S 103.93°E) displays a resonant geoposition situated precisely along 4° South latitude, separated by exactly 1° of latitude from Leang Leang, Sulawesi. Furthermore, Harimau Cave is 5,341 miles from the Great Pyramid, comprising 21.46% of Earth's mean circumference. 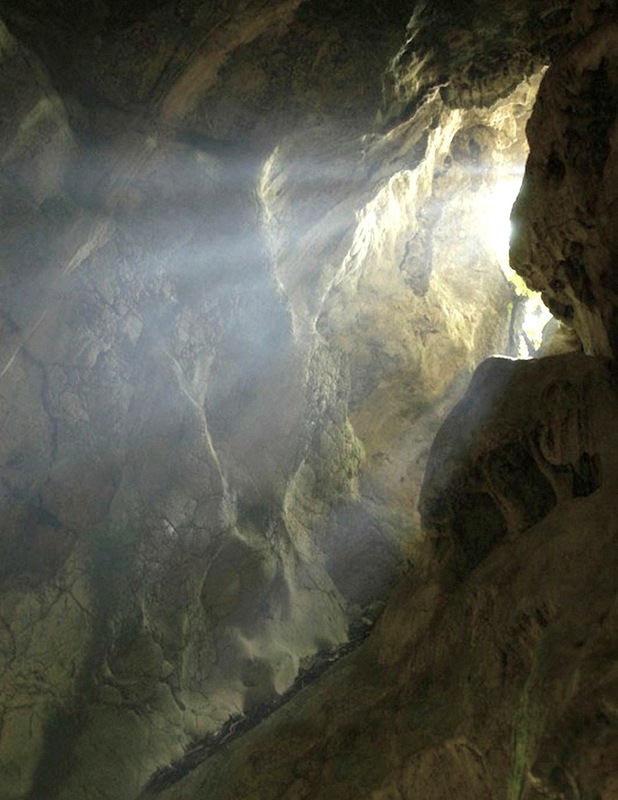 Several dozen other caves have also been identified in the immediate vicinity of Harimau Cave, confirming that the site was a much larger Paleolithic community closely mirroring what has been discovered in Sulawesi's Leang Leang Valley. This specific combination of geopolymer refaçading, Paleo-Sanskrit texts and high-precision geopositioning alignments confirms the use of sophisticated infrasound resonance technologies for transceiving the bioelectrical granting of Jupiter.